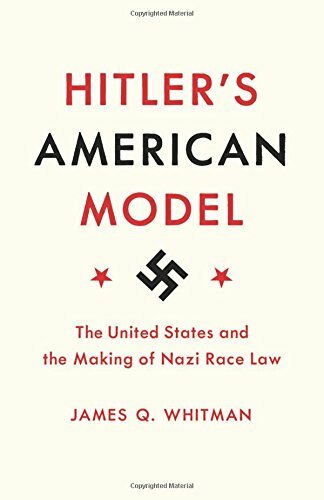 It is entirely possible that the vast majority of Americans have never thought of or even considered the possibility that their country and its white supremacist legislation of the 1930s would ever have been the model or basis or had any influence on what the Nazis did when it came to their own racial exclusionary laws against Jews and other minorities in that same time period. Author James Q. Whitman, of the Yale Law School, has demonstrated just that in this interesting and eye opening volume which is rather embarrassing, if nothing else, to the United States as the professed land where “all men are created equal.” Indeed, Whitman states that, in one respect, the Nazis thought that, surprisingly, one law was too harsh and declined to implement the same in their system. Once in power, the Nazis turned to what they considered the “world leader in racist legislation,” and particularly racist immigration law, as they pondered many of the same questions of what should constitute the specifications for citizenship, the definition of racially pure blood for purposes of said citizenship, and the prohibition of mixed marriages in order to reinforce that pure blood. The eventual Nuremberg Laws were designed to oppress Jews and other minorities to the extent of driving them out of the country. And if they didn’t, then laws obviously would be in place to deal with them as necessary. This was certainly long before the Final Solution was ever discussed and implemented. The first law dealt with citizenship. The Nazis based theirs on that of the United States. They differentiated between actual rights holding Germans and others who would be considered mere “nationals.” In the case of the United States, that would be Asians, Indians, and African Americans whose rights were abrogated through various subterfuges and evasions with respect to the 14th Amendment, which the Nazis noted. The next portion of the laws centered around who would be considered “colored.” How much of that blood relegated one to second class status or that of a national? Some wanted a “one drop law” where one was automatically a colored if “contaminated” by one drop. Others argued against that extreme and based it on a percentage or particular number of one’s ancestors who were of the undesirable category. Finally, although not embodied in actual legislation, the Nazis made their own comparison between their stated goals and the 19th century Manifest Destiny of the United States. Having expanded westward and, along the way, destroying their own Untermenschen, the Indians, the United States achieved its own Lebensraum. The Nazis availed themselves of this example to ultimately guide their later actions in the East regarding the many Slavic peoples there. Whitman argues that one should make the distinction between all of American racist law and not just the Jim Crow system. There was much more there for the Nazis to digest than that which was occurring in the American South. It is essentially an all-round condemnation of this country and its contemporary legal system. The book has a handful of photographs interspersed in the text of personalities, contemporary posters, and other related materials. The sources are noted in traditional footnotes with no bibliography but a proceeding section of suggestions for further reading is provided. In spite of the Nazis’ disdain, to put it mildly, for our stated and evident liberal and democratic principles, they eagerly looked to the United States as the prime example for their own goals of protecting the blood, restricting citizenship, and banning mixed marriages. Reading this book could make many Americans doubt the possibility of ever forming a more perfect union with such a legacy.